The festival in San Bernardino was the "Electric Barnyard Festival." Country music star Marty Stuart just released a new album with the daunting title of Country Music. On this release, he and Merle Haggard performed a duet on a tune called "Farmer's Blues." They liked working together so much, that they decided to tour together. So was born what came to be known as the "Electric Barnyard Festival." The second stop on the tour found them at the grounds of the National Orange Show in San Bernardino. The show in San Berdoo was also broadcast nationwide on XM Radio. They created their own environment, as they built a barnyard of sorts. As you walked into the barnyard there was a mechanical bull. On either side of the gate were tables with merchandise. There was a table where some of the performers went after their show to meet the fans. There was a bar and fast food area as well. The stage was set up toward the rear. On either side of the stage were equipment trucks with pictures of Merle Haggard and Marty Stuart and his Fabulous Superlatives painted on the side. The area held about one thousand people and was three quarters filled. Opening the festival was Bobby Pinson. Pinson came out with only an acoustic guitar. He told the crowd that he had asked for a chair, "Not only did I not get a chair, but they took my band too." Pinson performed a number of self-written tunes. He finished by saying, "I appreciate you sitting there and listening to songs you never heard before. Truth be told I barely know them myself, so we're in the same boat!" Next up was the Old Crow Medicine Show. This was a group of young men who sang very old country tunes, such as Earl Johnson and the Clodhoppers' "Johnny Get Your Gun" from the 1920s. They were all-acoustic, with string bass, banjo, fiddle, guitar and harmonica. Ketch Secor played some fine harmonica. Marty Stuart joined them on mandolin and vocals for a few songs. We thought they were a lot of fun and very talented. Now it was time for Connie Smith. Smith is a classic country singer in the fashion of Patsy Cline. She has a strong clear voice. She was backed by a crack band, especially Johnny Cox on pedal steel. 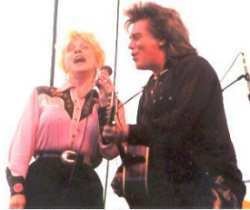 Marty Stuart also joined Smith on stage, as he did with the previous band. Smith and Stuart were celebrating their sixth wedding anniversary. Stuart joked, "Happy anniversary dear, I took you to a parking lot in San Bernardino." Stuart and Smith performed a duet together. Then Stuart's backup band the Fabulous Superlatives came on stage and sang a version of "Jackson" to them in honor of their anniversary. The Superlatives and Stuart stuck around long enough to sing backup on Smith's first hit "Once A Day." Smith finished her set with "How Great Thou Art." Now it was time for Marty Stuart to have the stage all to himself (interesting that he did not share the stage with any of the other performers). As soon as he put on his guitar he started playing. Stuart loves being onstage, as he clowned around and put a lot of energy into his songs. He performed songs from the new album, like "A Satisfied Mind" and "Too Much Month (At The End Of The Money)," as well as older tunes, like "Hillbilly Rock" and "The Whiskey Ain't Workin' Anymore." He introduced "Farmer's Blues" by saying that if Merle Haggard had memorized the lyrics he would be up there performing with him. Stuart did a fine job of it himself. The audience was definitely into him as they kept calling out requests and would clap along without being prompted. Merle Haggard closed the show. He performed many of the songs he is famous for, including "Okie From Muskogee," "Silver Wings," "Mama Tried," "Are The Good Times Really Over," "The Bottle Let Me Down," "Misery And Gin," and "Working Man Blues." He does not move around a lot, but he knows how to hold an audience's attention. On a fine summer evening the "Electric Barnyard Festival" made for a great night of Country Music.